It is summertime and the living is easy, even when everyone in your family wants different toppings on their pizza. 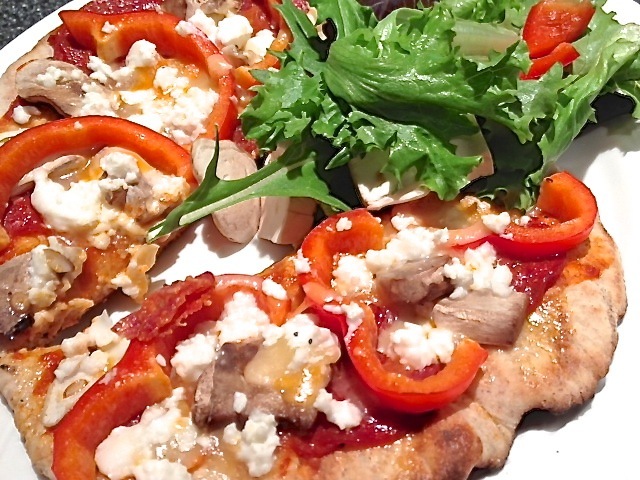 This is a quick and easy way to make great crispy pizzas that everyone will love. The bonus, you don’t have to heat up your kitchen to have great, homemade pizza! Combine the pizza sauce ingredients and let sit at least a half hour to two hours. Refrigerate unused portions. Add the yeast and the sugar to the room temperature water, stir and leave it. Mix the flours and sugar, once the yeast starts to activate, pour into the center of the flour mixture and either mix by hand or using a stand mixer until a smooth, elastic ball forms. You may have to add a bit of flour or water depending on conditions. Gather the family and give each one a ball of dough. Have them wash their hands first. Lightly flour your hands and the counter. Press the ball into a disk, lift off the table and work your hands around the edge of the disk continuously to create a flat 7″ – 8″ disk. Let gravity help you create your pizza. Preheat your grill to medium while you let the formed pizza dough rest for 8 to 10 minutes. Grill the dough on one side until it is cooked on one side (about 3 to 5 minutes). Take off the grill and add your sauce and then your toppings. Return to the grill and cook until the other side of the pizza is cooked and grated cheese is melted (this should take 3 to 5 minutes). Magda’s Frugal Tip: Starting crafting Christmas and other winter holiday gifts NOW! That way, you will have time to finish them before you need them and will not have to go out and buy replacements because you ran out of time. Make a list of who you will make gifts for, what you will make each person and what materials you need. Find or purchase everything to make at least one gift, and put all the tools and materials together into a homemade “kit”. I always have several project “kits” on the go and that works for me, some people prefer working on only one thing at a time. Just don’t feel compelled to buy everything for all the gifts at once. That way if you do run out of time, you have not spent the money on a gift that you are not going to make. I’m all about starting Christmas in July. It makes it a little less stressful during the holidays.